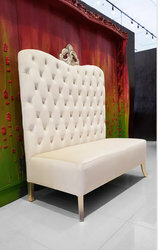 The Adonis High Back Luxury Chaise Sofa offers comfortable Rococo style with modern home furnishing appeal. 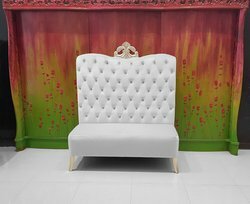 Its soft velvet upholstered seat and back marry beautifully with the tuft velvet encased buttons that run along the entire back of this modern lounge sofa. 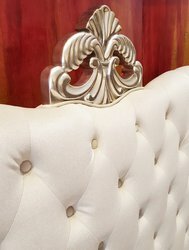 Its ornate, hand carved solid wood birch frame offers an additional elegant touch boasting the workmanship both within the solid wood internal frame of this modern chaise sofa and overflowing to its exterior sweetheart top frame and tiara headdress frame and legs.